The biological family Felidae commonly known as cats is composed of two subfamilies: the Pantherinae which includes the lion, tiger and jaguar species among others and the Felinae which groups the cougar, the cheetah and the domestic cat to name just a few. Felids are carnivorous mammals of various sizes which inhabit most habitats around the world. They have adapted to icy environments, tropical jungles while some were domesticated and now live in peoples' homes. Their body can mimic the outside medium so they pass unnoticed and approach easily their prey. Most of them are agile hunters displaying extraordinary chasing skills. Tigers can be found in the evergreen forest of Bengal and the semi-evergreen in Assam, both being Indian locations. Some populations of tigers are also traceable in the mangroves of the Ganges Delta. Tigers are good swimmers being able to go for 4 miles without giving signs of exhaustion. This is the reason for which they usually settle around water sources like rivers and lakes where they have good chances to hunt the animals coming to drink water. 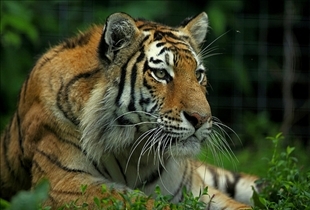 In earlier decades, tigers inhabited large parts of the Asian continent, but now many species are extinct because of excessive hunting as well as dramatic changes in their habitats. Lions inhabited most regions in Africa and Eurasia comprising the space between Western Europe to India. Now they populate only eastern, southern and western regions in Africa. The Asian lion can be found only in the Gir Forest National Park in the Indian state of Gujarat. The fur of a tiger is covered with up to 100 stripes of diverse density and coloration ranging from gray to brown to black. The ventral area fur is white as the one on extremities of the face. The striped pattern is unique according to most scientists. Females are smaller than males in size. The male's forepaws pads are wider. Tigers have strong legs and a good body structure enabling them to drag heavier prey. The lion has a prominent head covered at the extremities by a mane which gives the impression of a bigger figure. A lion's fur is usually yellowish, reddish or of a dark ocher nature. It has no stripes. Lions have powerful legs. Tigers are solitary animals having a strong sense of their territory which can extend up to 100 sq. 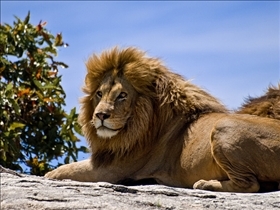 km, while lions can either live in groups of up to 30 individuals or live like nomads. On the other hand, famous performers in Las Vegas and elsewhere feature seemingly tamed tiger ambassadors. By far, the best example of human interaction with lions can be seen on the Kevin Richardson of South Africa's YouTube videos. He can be seen kissing one right on the muzzle! Tigers inhabit mangrove and evergreen forests in India, while lions can be seen in various parts of Africa. The tiger has its body covered in stripes and powerful legs. The lion has a mane covering the extremities of his head, powerful legs. His fur is not striped. Tigers are solitary animals, while lions can live in groups or choose to be nomads. Both tigers and lions are often attractions at zoos around the world. Some have even been trained to perform in places like Las Vegas, Nevada. Tigers and lions are used as acts in circuses and Las Vegas acts regularly. Kevin Richardson is a real life South African lion whisperer. Which animal is more beautiful?